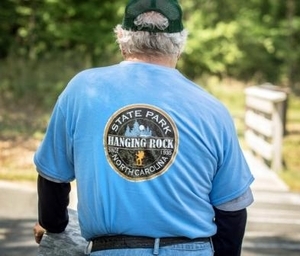 Hanging Rock State Park 100% cotton adult t-shirt. Hanging Rock State Park 100% cotton adult t-shirt. Colors include light blue and gravel(grey). 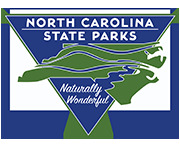 Large logo is on the back of the t-shirt, front logo says "Hanging Rock State Park" on the upper left chest.